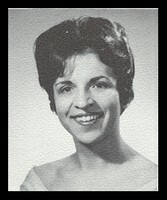 Faye Elton Rosvall, 24, 4645 Colgate St., Granger, died August 1, 1969, 6:10 p.m., in a Salt Lake hospital of natural causes. Faye was born March 1, 1945, in Provo, to Adrian and Lillian Elton. She married Gene H. Rosvall Nov. 20, 1964, in the Salt Lake Temple, Church of Jesus Christ of Latter-day Saints. She was a member of the Kearns 17th Ward. She graduated from Olympus High School and the Continental Beauty School. She was a licensed beautician. She is survived by her husband, sons Robert Cory, and Todd Howard, both of Granger, mother and stepfather, Mr. and Mrs. Harold Drage, Salt Lake City, brothers Dan Elton, Ft. Oututt, Nebraska, Lawrence Elton, Renton, Washington, Jerry Elton, Tooele; sisters Mrs. Fred (Sue) Morris, Biloxi, Mississippi, and Miss Dawn Elton, Granger. Funeral services will be held Monday, 11 a.m., Kearns 17th Ward chapel, 4234 W. 5015 South. Friends may call at 36 E. 7th South Sunday, 7-9 p.m., and at the church one hour before services. Burial will be at Valley View Memorial Park. Click here to see Faye's last Profile entry.